Our sometimes blog topic and all-around fabulous babe, Desiree Horton, is featured in a great one-page article in the current Los Angeles Magazine. 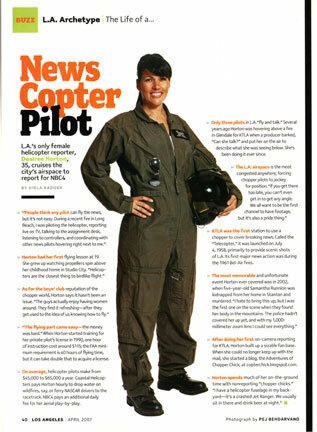 Unfortunately, the magazine doesn't mirror all its content online, so you'll have to seek out the issue (the April one, with actor Aaron Eckhart on the cover) and turn to page 40 to learn more about "The Life of a News Copter Pilot." You can also visit Desiree at her own blog at The Adventures of Chopper Chick. Many of you have found your way here due to Desiree, and we thank you--and her!--for that. Sure have to agree with the previous post. I find it very difficult to understand why station management can't understand what an asset they have in Desiree Horton and make more and better use of her. Desiree is so pretty and has so much audience appeal that not having her on camera for part of her reports is a crime. Lots of people have found their way to your blog because of her, and many would watch the news on NBC4 just to see her. I know I used to watch the KTLA "Morning News" solely because of her. People should contact NBC4 and tell them to please put Desiree on camera.